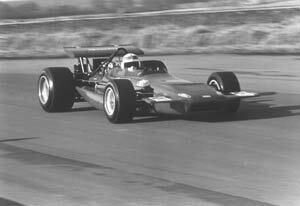 My last Formula One car launch at Silverstone was on February 6th, 1970. So it was quite interesting for me to come back to the same track on January 27th, 2001, almost 31 years later, for another launch - this time of the new BMW-Williams. 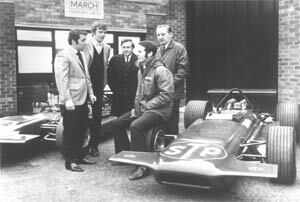 My reason for attending the 1970 launch was that I was friendly with Chris Amon, who was to be the lead driver for a brand-new racing-car company: March Engineering. Chris was there for the introduction of the March 701, of course, as were Jackie Stewart, Mario Andretti and Ronnie Peterson among the drivers - not a bad bunch! Other luminaries on hand were Max Mosley, Robin Herd, Andy Granatelli and Ken Tyrrell. Then the actual press conference was held in a room that normally served as a caf� in the paddock - nothing at all fancy. The main interest was in the cars, which were in the paddock and also on the track, where Chris and Jackie turned a few laps. In 2001 things are done somewhat differently. BMW-Williams made a big deal of the fact that their car would be seen actually running on the track, a long-forgotten feature of racing-car launches. The weather in windy Northamptonshire was the same on both occasions - chilly. We formed an orderly line to get our BMW-WilliamsF1 name tags and then went upstairs in the press center for coffee; banks of computers were set out for the use of those filing their stories on the day. Then at 11:00 am we went to a huge and elaborate heated tent set up in the infield, housing a stage with a turntable. The stage had a long table with microphones for the interviewees. A raised area was provided for all the massed video cameras behind a few rows of seats. James Allen of ITV interviewed the team chiefs, including Frank Williams and Patrick Head from Williams, and Mario Theissen and Gerhard Berger from BMW. Then the two drivers came out, wearing their inevitable goofy caps, and pulled the cover off the new FW23. It looked good, although I don't think the new heavily-blue livery is as stylish as last year's car. While the drivers did TV interviews, the executives and designers were rotated through three seating areas - one for the British press, one for German-speaking press and the third for 'rest of world'. Oddly, the interviews in the German-speaking press area were conducted in English! German speech was very much in the air throughout the tent, however. Lots of 'very important' Germans were on hand to perform their various tasks, including the guy whose assignment seemed to be to keep reminding the turntable operator that the left side of the FW23 had a better decal job than the right side. Williams has fielded three cars in the pre-season tests because one was needed for the experienced Ralf Schumacher to use in developing tires with new boys Michelin, one was needed for Montoya to get used to Formula One racing again and one was assigned to Marc Gene to put miles on the new 90-degree-banked P80 BMW engine and its seven-speed L65 longitudinal gearbox. BMW now have an in-house foundry in Munich for racing-engine castings and are able to machine more of the engine in-house as well. They have high confidence in Montoya but accept that a major challenge will be to get his car properly dialed in for each circuit during the season, because many tracks will be new to him. BMW considers that with an existing engine concept it's possible to make perhaps a 10 percent improvement for a new season, but they want more than 10 percent for 2001 - which is why they have a completely new V-10 with a wider bank angle among many other changes. The new rules controlling the number of elements in the rear wing are not unwelcome, bearing in mind that some rear-wing arrays at Hungary last year had as many as nine separate elements. This seemed over the top to Head. The push toward a lower center of gravity is considered to be all the more important at a time when the tire width and contact-patch size are so strictly limited with the use of grooved tires. The steady modifications that are made to a Formula One car during the season are such that at the end of the year 60 percent of the car will be different to the way it was at the beginning. With the new rules controlling the front and rear wings, cars initially lost 15-20 percent of their downforce for the same drag. Williams has tried hard to recoup that loss. "We are not back there yet but we have closed the major part of the gap," said Patrick Head. One of the main reasons that Williams has gone to Michelin was that Frank Williams was obliged by Bridgestone to pay for his tires last season. This galled, especially because Frank couldn't recall having to do that since something like 1974! He also found his team low in the pecking order for testing opportunities of new rubber. "If you have a fundamental problem in the engine," said Mario Theissen, "it's virtually impossible to solve it during the season." So far it seems that BMW doesn't have such a problem. 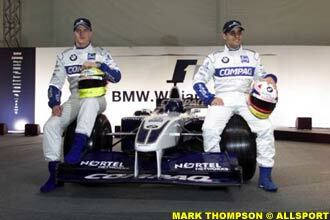 BMW prefers to work with only one team, because that way a better integration of the engine and car can be achieved. Each has to be designed to suit the other.